WEDDING DECOR, HOME DECOR, AND MORE - Add a splash of color to your home, business, or wedding decor. Create a dramatic effect by mixing different sizes and plant types. With multiple sizes and plant types available, the possibilities are endless!Topiary Balls can be used both indoors and outdoors to enhance the look of any space. 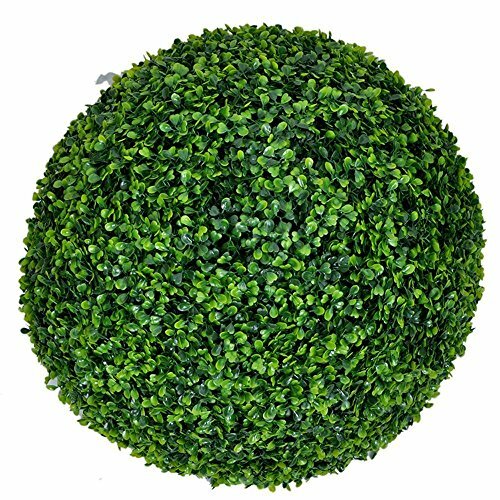 Artificial topiary balls don't require any maintenance, trimming, or upkeep. Dimensions: Each set comes with 1 pieces of 19 inch milan ball . WEDDING DECOR, HOME DECOR, AND MORE - Add a splash of color to your home, business, or wedding decor. Create a dramatic effect by mixing different sizes and plant types. With multiple sizes and plant types available, the possibilities are endless! Topiary Balls can be used both indoors and outdoors to enhance the look of any space. Artificial topiary balls don't require any maintenance, trimming, or upkeep. No maintenance, trimming, or upkeep. This Greenery Panels give you the look of a live plant without the work of caring for a live plant! Panels don't require any water and will look amazing year round.